SALAD THE LAST! We bring you the last installment of this year-long blog project, "52 Weeks of Mason Jar Salads." For this final post, I decided to adapt the classic middle-eastern bread salad, adding less common ingredients (chickpeas, feta,) to make the salads more filling, but maintaining the flavors of the original - sumac, olive oil, fresh veggies, herbs, and greens. 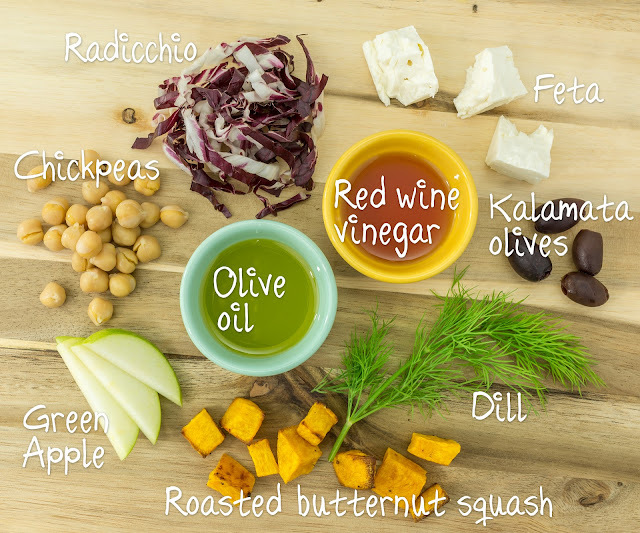 Although many of these ingredients are well out of season for most of us in the northern hemisphere, a boost of fresh veggies is just what I need to follow rich holiday foods and too many cookies this time of year. This blog series has been a great challenge for Rob and I - we've learned how to work well together, some new skills surrounding food styling and photography, how to eat more veggies on a daily basis, and how to think outside the box when we make a "salad." We've found some new favorites, and hope you have, too! 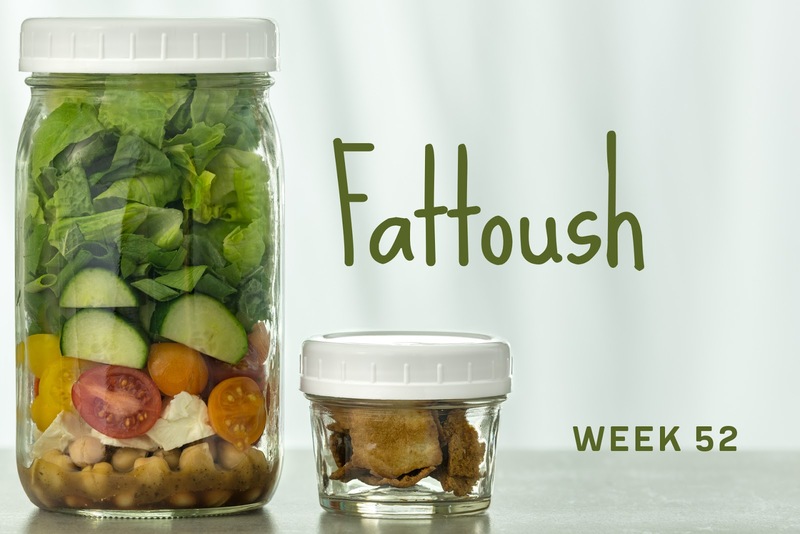 Thank you for joining us for "52 Weeks of Mason Jar Salads!" Make the pita chips: preheat the oven to 425 degrees Fahrenheit. Scatter the pita pieces on a baking sheet, spray with olive oil, and season with salt and pepper. Bake the pita chips for 5-10 minutes, or until evenly dried and golden brown. Cool. Pack the salads: divide the dressing evenly between each of 4 tall quart-sized containers. 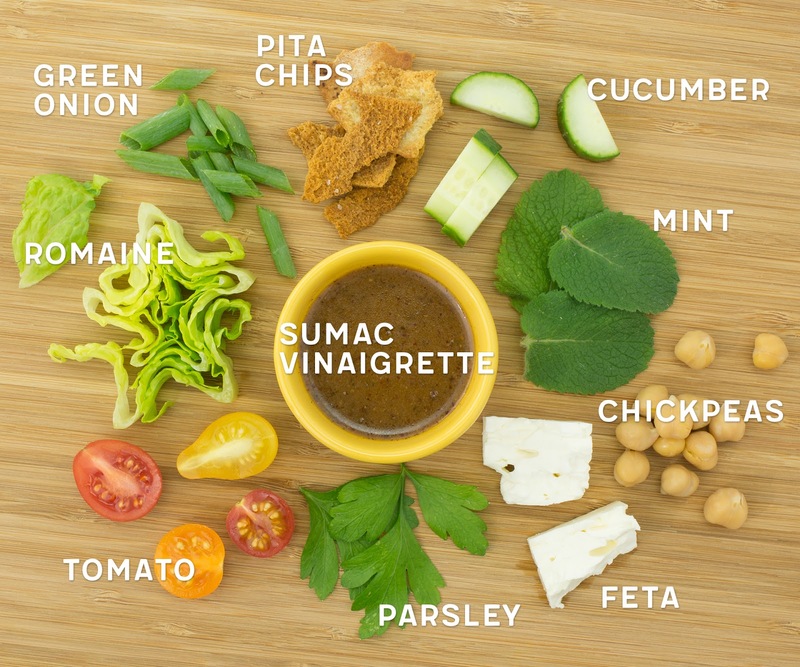 Layer the chickpeas, feta, tomatoes, cucumber, green onions, parsley, mint, and romaine in the jars. Divide the pita chips evenly among 4 snack-sized zip-top baggies, one for each salad. Refrigerate until serving. Enjoy your salad: invert your salad onto a plate or into a bowl. Top with pita chips. TIME-SAVING TIPS: Substitute store-bought balsamic vinaigrette, canned chickpeas, and store-bought pita chips for the homemade dressing, home-cooked chickpeas, and homemade pita chips. SPECIAL DIET SWAPS: This salad is vegetarian and nut-free as-is. For a vegan salad, omit the feta and increase the amount of chickpeas to 4 cups, or use your favorite vegan feta. For a gluten-free salad, substitute your favorite gluten-free bread or flatbread for the pita; you may need to adjust the baking time on your chips/croutons. After spending the last two days straight baking Christmas cookies, (I kid you not ... a dozen different varieties!!!) I feel like some nutrition is in order! 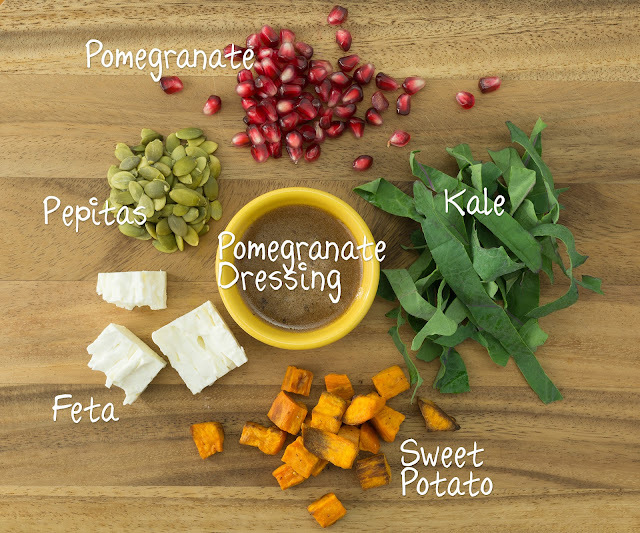 Sweet potatoes, pomegranates, kale, and pepitas are all loaded with nutrients, lightly dressed with some salty feta and a sweet-tart homemade pomegranate vinaigrette. I hope you enjoy this welcome break from all of the rich foods of the holiday season as much as we have! Make the pomegranate dressing: combine the pomegranate juice, vinegar, honey, oil, and salt and pepper in a pint-sized mason jar or other tall container. Puree and emulsify the dressing using a handheld stick blender. Pack the salads: divide the dressing evenly between each of 4 tall quart-sized containers. 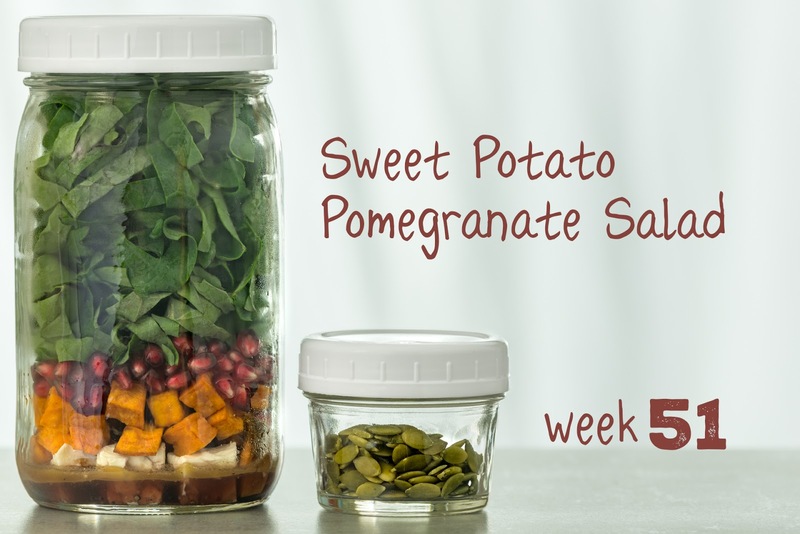 Layer the feta, sweet potato, pomegranate, and kale in the jars. Divide the pepitas seeds evenly between 4 2-oz jars or snack-size zip-top bags for each salad. Refrigerate until serving. Enjoy your salad: invert your salad onto a plate or into a bowl. Top with pepitas. TIME-SAVING TIPS: Use your favorite store-bought red wine vinaigrette in place of the homemade dressing. Use 4-8 oz prewashed baby kale in place of the stemmed, shredded kale. SPECIAL DIET SWAPS: This salad is vegetarian, nut- and gluten-free as-is. For a vegan salad, use agave instead of honey in the dressing, and omit the feta or substitute with your favorite vegan feta. This is a beautiful salad - crisp, green, colorful, and sparkling-fresh. During these dark days of December in the northern hemisphere, I tend towards mostly cooked foods - soups, breads, baked casseroles, grits, pastas, things covered in cheese - but I also welcome a burst of freshness every now and then! I hope you enjoy this nutritious, gorgeous salad as much as we did! 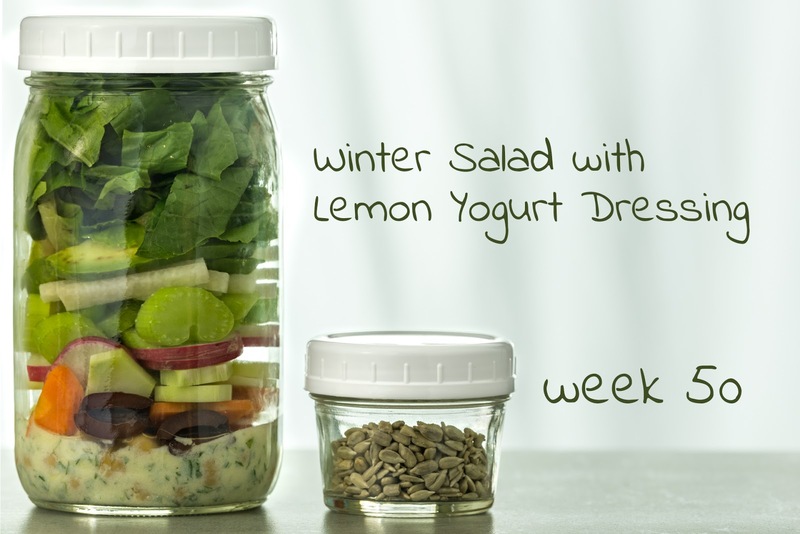 Make the lemon-yogurt dressing: combine the yogurt, olive oil, lemon juice, garlic clove, and salt and pepper in a pint-sized mason jar or other tall container. Puree and emulsify the dressing using a handheld stick blender. Stir in the parsley. Pack the salads: divide the dressing evenly between each of 4 tall quart-sized containers. 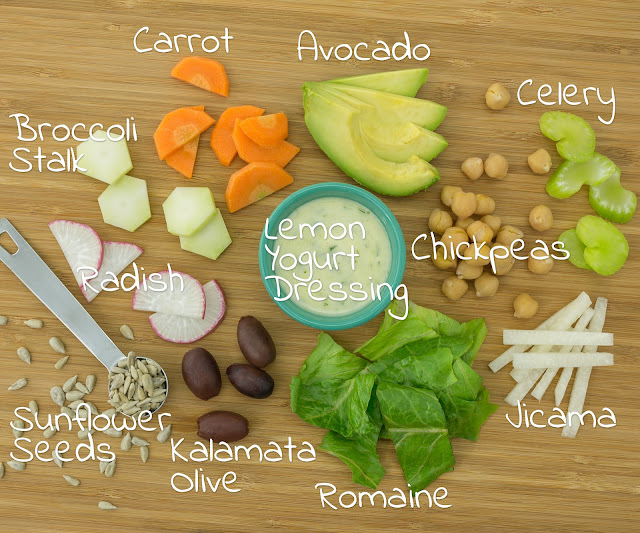 Layer the chickpeas, olives, carrots, broccoli stalk, radishes, celery, jicama, romaine, and avocado in the jars. Divide the sunflower seeds evenly between 4 2-oz jars or snack-size zip-top bags for each salad. Refrigerate until serving. Enjoy your salad: invert your salad onto a plate or into a bowl. Top with sunflower seeds. TIME-SAVING TIPS: Use your favorite store-bought yogurt dressing in place of the homemade dressing. SPECIAL DIET SWAPS: This salad is vegetarian, nut- and gluten-free as-is. For a vegan salad, substitute your favorite plain non-dairy yogurt for the Greek yogurt in the dressing. We have a fairly large garden, and enjoyed a bountiful harvest last growing season. This year, however, was less than stellar ... it seems like the only things that did well this year were greens and herbs! (So. Much. Kale. I think I'll plant fewer than 11 plants next year!). However, when we were anticipating the first freeze this fall, I was pleased to find quite a few butternut squash lurking around, that I had somehow overlooked earlier in the season. Win! Whether you grow your own or enjoy squash from the store, this unique and colorful salad will please squash lovers in a new and interesting way. Enjoy! Pack the salads: add 1 tbsp olive oil and 1 tbsp vinegar to each of 4 tall quart-sized containers; season with salt and pepper. 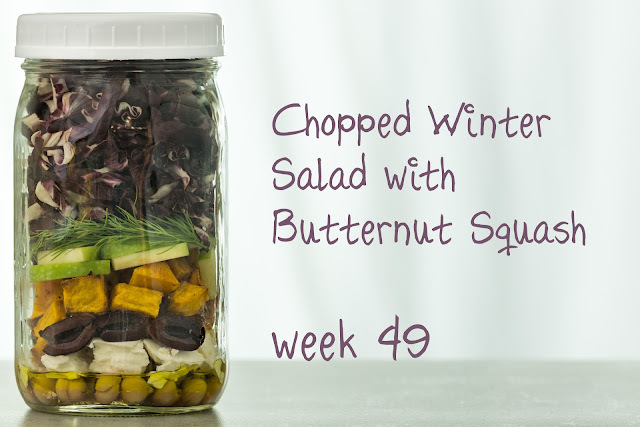 Layer the chickpeas, feta, olives, roasted squash, apple, dill, and radicchio in the jars. Refrigerate until serving. TIME-SAVING TIPS: Use canned chickpeas, drained, rinsed, and patted dry for the home-cooked chickpeas. Buy pre-chopped butternut squash for roasting instead of peeling and chopping a small squash. SPECIAL DIET SWAPS: This salad is vegetarian, gluten- and nut-free as-is. For a vegan salad, omit the feta and increase the chickpeas to 2 cups, or substitute your favorite vegan feta for the dairy feta.